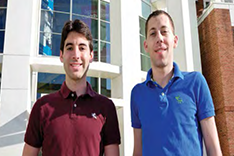 Diagnostic anSERS co-founders Eric Hoppmann (left) and Sean Virgile (right). Original article from the Clark School's Biofeedback Magazine. Diagnostic anSERS, the Fischell Department of Bioengineering-based start-up company founded by graduate students Eric Hoppmann and Sean Virgile, both advised by BioE and Institute for Systems Research Assistant Professor Ian White, has introducted a groundbreaking Surface Enhanced Raman Spectroscopy sensor - otherwise known as a SERS sensor - that enables trace chemical detection for only a few dollars per test. the sensor is poised to bring SERS into the mainstream. SERS enables measurement of a molecules's uniquely identifying Raman "fingerprint" at trace levels. While Raman alone can only identify bulk materials, SERS enables the sample's molecular fingerprint to be obtained at millions of times lower concentrations that would be possible using Raman alone. By applying a sample to a SERS substrate (sensor) and measuring the fingerprint with a handheld spectrometer, molecular identification can be carried out at the parts per billion level in less than a minute. P-SERS™ is the first SERS sensor that is both cost effective - at a few dollars per test - and highly sensitive. While existing substrates are rigid sensors on silicon wafers, P-SERS™ substrates are flexible and can be used as dipsticks or surface swabs as well as a cost-effective alternative to existing silicon wafer substrates. Diagnostic anSERS is able to achieve this combination of high sensisitivity without high cost through a patent-pending technique in which roll-to-roll ink-jet printing is used to precisely deposit special nanoparticle ink onto paper and other flexible support materials. These easy-to-use sensors can be used for detection of a wide variety of molecules, including drugs, explosives, food contaminants and taggants for anti-counterfeiting. Additionally, there are custom sensors available that can be optimized for detection of targets which are difficult to measure and/or require ultra-high sensitivity, such as biological markers. Tests which previously would have required samples being sent to centralized labs, with the consequent multi-day wait and high price tag, can now be performed on-site. Affordable access to this class of ultra-trace detection enables practical screening in a wide variety of applications. P-SERS™ research was recently featured as the cover article in the analytical chemistry journal, Analyst. In the piece, the researchers demonstrarted detection of malathion, an organophosphate - or class of insecticides and nerve agents - at 413 picograms. They also demonstrated detection of heroin and cocaine at nine and 15 nanograms, respectively. Notably, these dipsticks and surface swabs were shown to provide repeatable, quantitative measurements, reporting the amount of drug residue on the surface (not merely presence/absence).